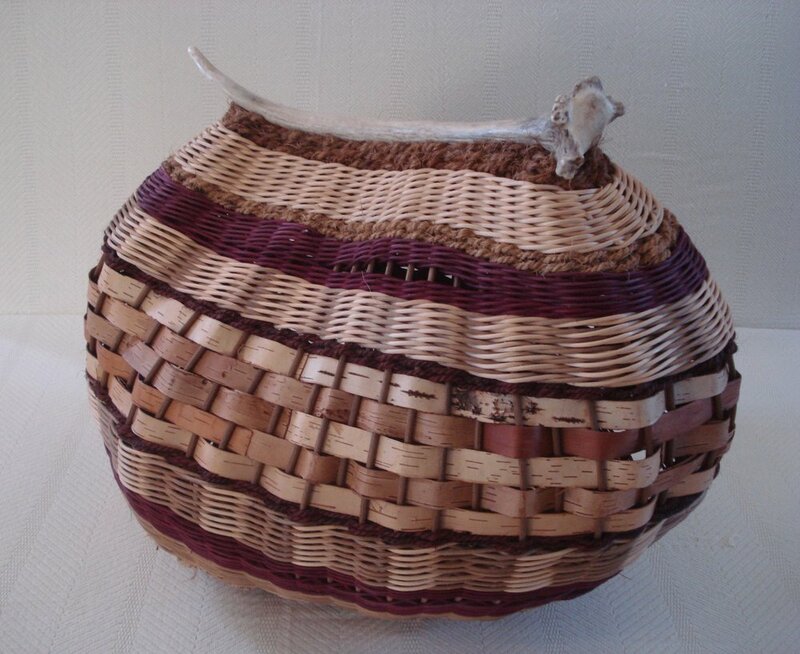 Willow basketmaker Jacki Bedworth, black ash basketweaver Fred Kogler, and antler basketweaver Cathryn Peters will each demonstrate their basketweaving techniques at the opening reception on Friday, August 3rd! 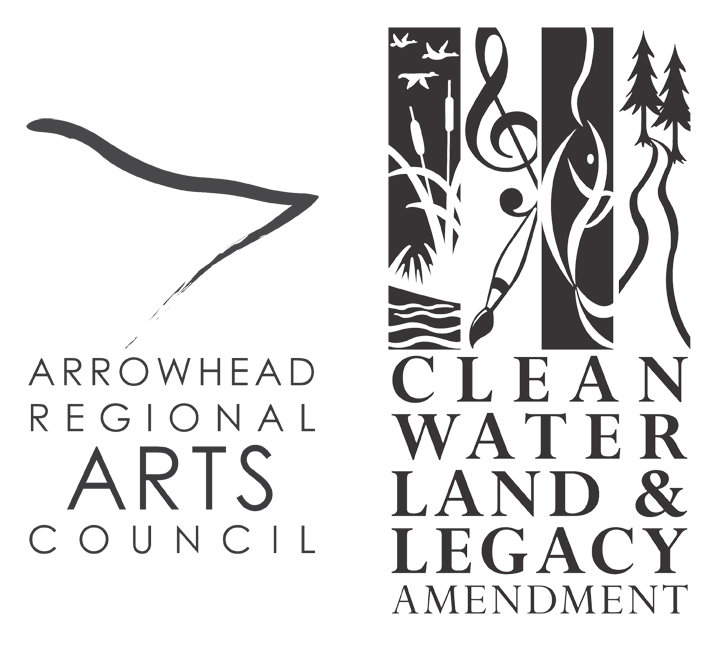 Join us for a fun evening of refreshments, weaving, and visiting with the artists. Willow weaver Jacki Bedworth strides forth into the Red Willows every spring to gather materials for her traditional basketry. Items of everyday usage are then transformed into sublime pieces of ingenuity and art. Fred Kogler takes logs of ash, strips them, polishes them, and weaves them into baskets artfully and individually designed for a variety of uses, from berries to bread. Fred has mastered the art of the Shakers and the “lightship weavers” who spent their days at sea weaving ash baskets. His sophisticated display and delight in sharing his passion art and history of baskets will delight and inform. 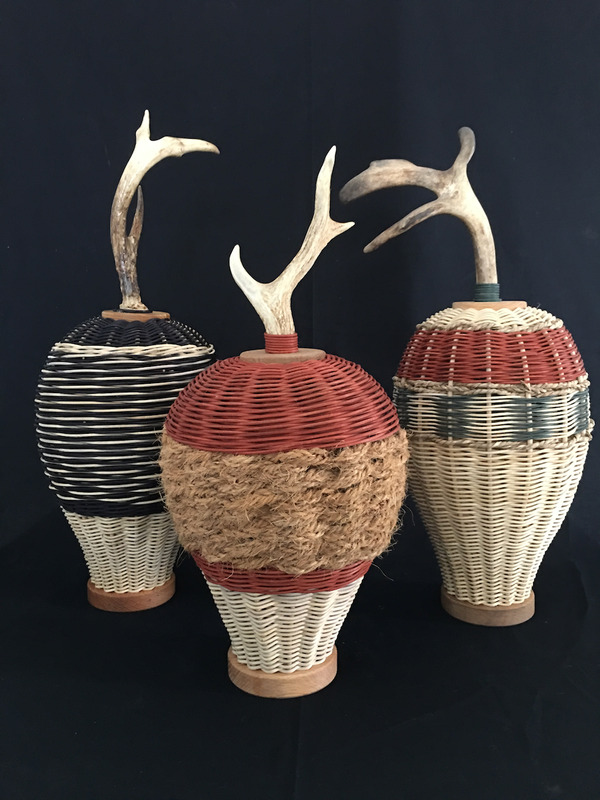 Cathryn Peters skillfully transforms basketry into decorative, award-winning designs, incorporating bold colors and shed antlers in ways that delight the eye and demonstrate the broad range of what basketry can be. Her recent entry into the gallery’s juried art show drew oohs and aahs from the crowd and kudos from the juror. These three master weavers will be sharing their skills, answering your questions at an open house reception on August 3 from 5 to 7 P.M. The gallery is delighted to present this exhibit of these local master weavers for your education and enjoyment. This is an evening you don’t want to miss. The Edge Gallery is open on Thursdays, Fridays, and Saturdays from 10:00 a.m. to 4:00 p.m. and during Edge events. Admission is free.